Yes, fall is definitely in the air now. Even though it is cooling down, I love how clear and sunny the sky is. I can take cooler temps as long as the sun is shining. 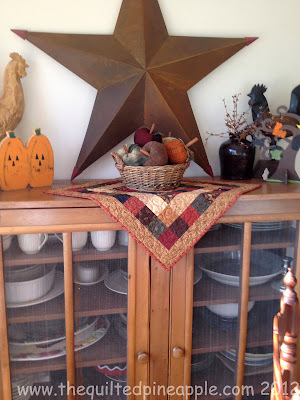 :-) So I thought I would give another peek at some of my fall decorating. The stars really don't go there. I just haven't decided on their permanent home yet. 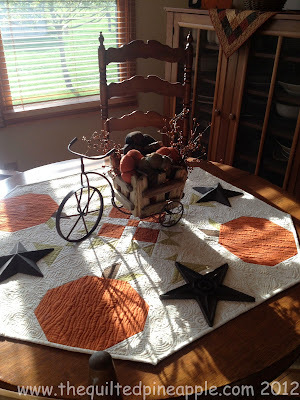 :-) The pumpkin table topper is a quilt I posted all about here. 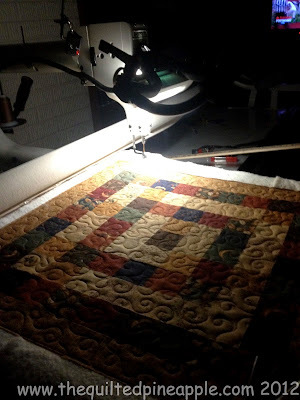 It was NOT quilted on my longarm. 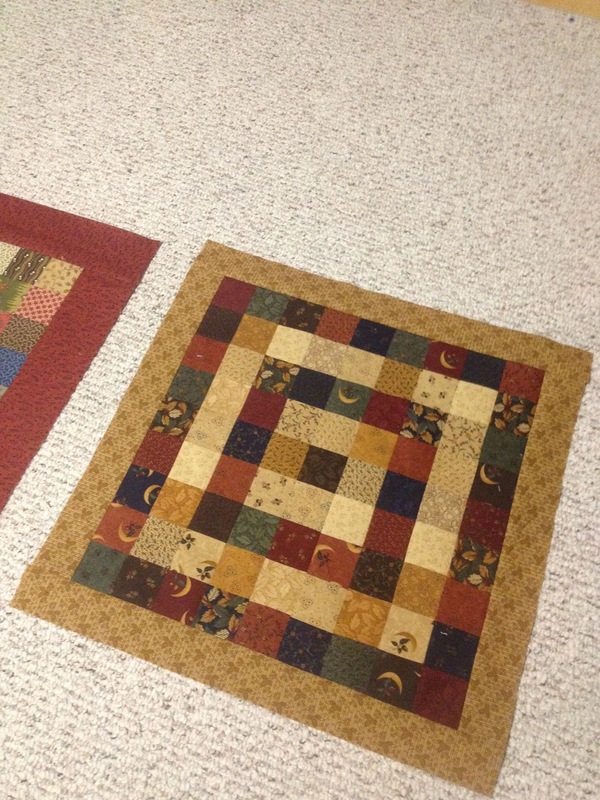 I quilted it waaayyyyy before I had a longarm. That was done on my regular sewing machine!! It's a wonderful reminder of how much my skills have grown since then. I picked the little primitive pumpkins up at Tracy's Primitive Creations. One of my favorite little shops to hit while the girls are at dance!! She does not have a website, but a facebook page here. And since it was the perfect size for on top of my pie safe...you can see where this story was going. No Itty Bitty this time. 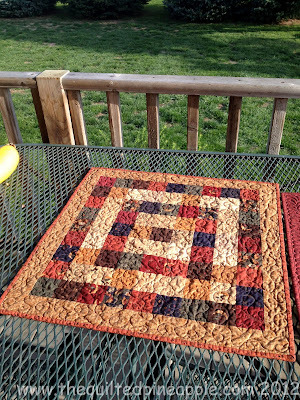 Just some simple allover quilting. The fabric is all Kansas Troubles for Moda. I think the whole thing from start to finish took about 2 hours!! I'll be over for dinner. I love your dining room! I think the stars look very good on the pumpkin table topper. At least until they find a home elsewhere. I love your dining room too!!! Your table topper is so festive, thanks for sharing. Very lovely fall decorations, Linda! I just love this time of the year. Love your little quilt you whipped up. It's a beauty! The quilting on the Pumpkin dining table topper is fantastic for that pattern. Love it. Love your decorating! I struggle with that. Looks like you have the knack! Your photos make me want to redecorate! Just toss it all out and start over. Beautiful fall touches in your lovely home. I always enjoy seeing how you decorate for the seasons, you really have fun don't you! Eye candy in every photo! The pumpkin table topper... gorgeous quilting, and I especially like the way you quilted the pumpkins. Thanks for sharing! I love your table toppers!! Very cute! I love you fall mini quilt. Mini's are always fun and when they only take 2 hours total to make even better! Wonderful quilts and decor, everything looks so nice and warm. Love your wool apples. Autumn is a beautiful lady! I heart the colors and aromas she has to offer. Love the pie safe. Gotta love a fast project that turns out so well! 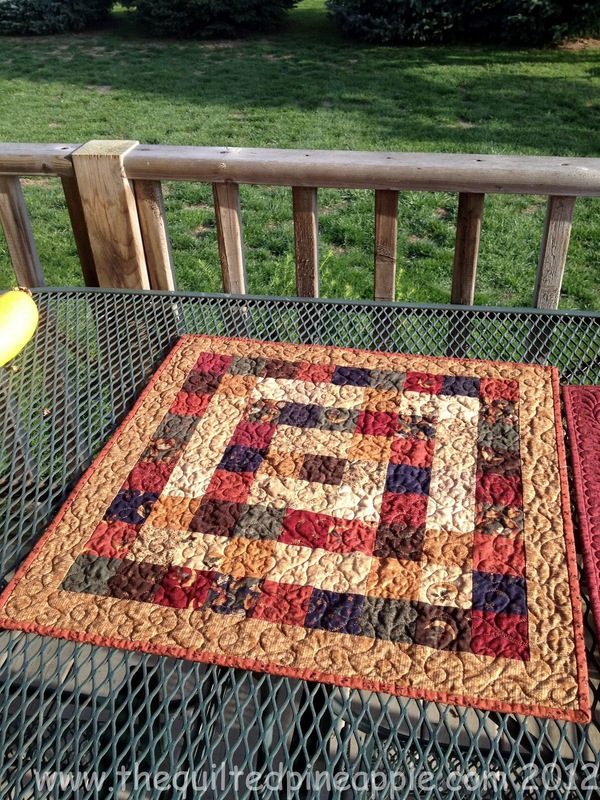 What a great little quilt! Looks great with all of your other decorating! I love your Fall decorations. 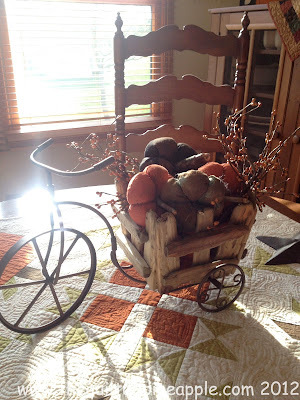 Cute wool pumpkins and the bicycle is a perfect centerpiece. Just gorgeous. I wish I had your decorating skills. My house is a pit. Seriously. The pumpkin table topper is spectacular. 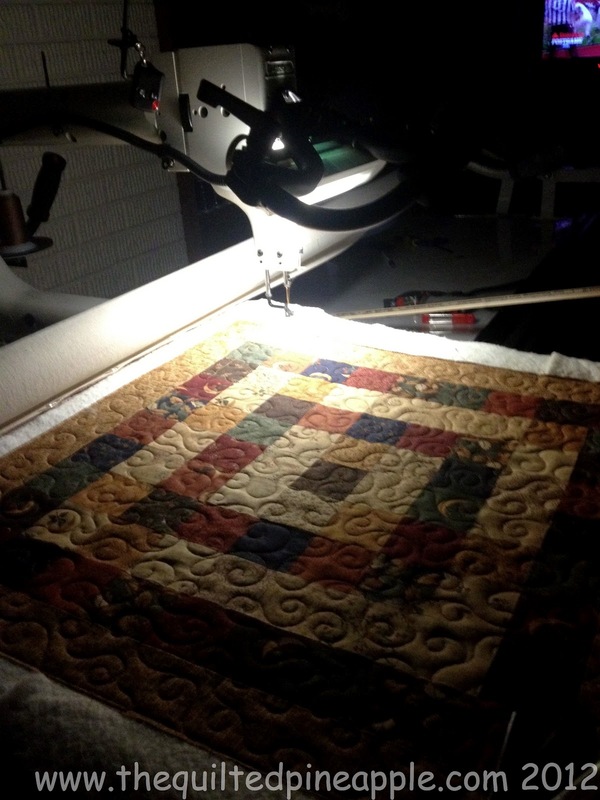 Your quilting was great then too. 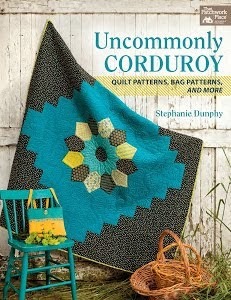 The little quilt is a nice accent piece. Love them both. I'd feel right at home. Just beautiful! Love your table toppers. Fall colours are so beautiful and warm, my favs. Awesome work! 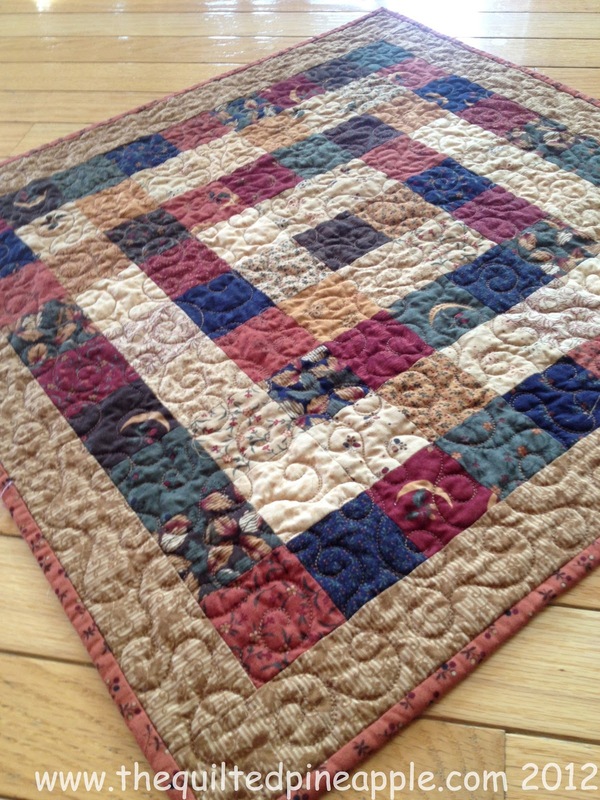 Thank you for sharing your lovely quilts, love your style. 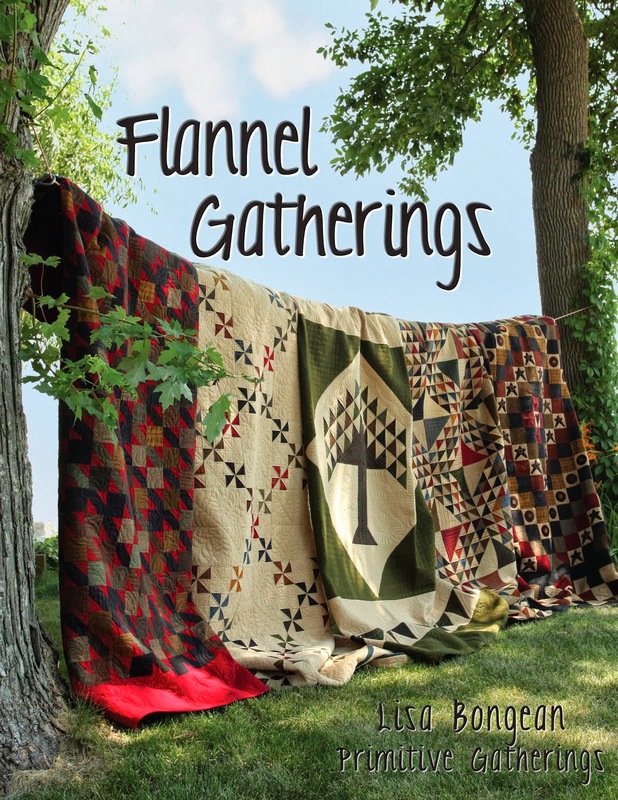 Found you on pinterest, you can find me at American Vintage Quilts. com or pinterest. 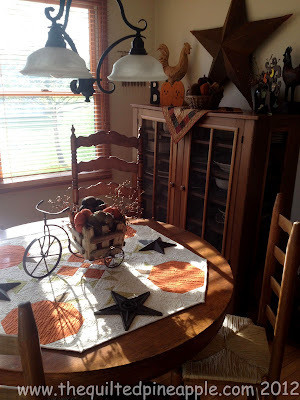 Your home is so beautiful with all of your fall decorations :-) I miss fall! We don't get much of it here in Florida. 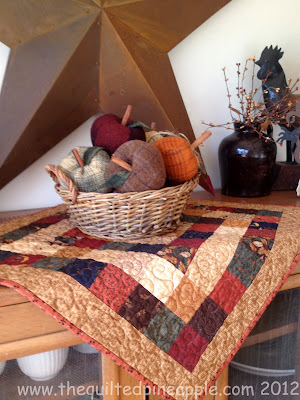 I am motivated to make some small fall quilts now. I love how you have them placed around. I am at a retreat in shipshewana so a perfect place to ick up some seasonal fabrics. Your decoration is so pretty, a very cozy home! Loved all of this as it is in the colors and modd of the season..,wish you lived closer to me!